Cooling down from your work week with a frozen margarita at happy hour may seem like a great way to celebrate the weekend (or a Tuesday, for that matter), but frozen alcoholic drinks usually pack in about 200 to 500 calories each. 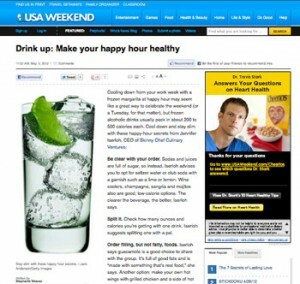 Cool down and stay slim with these happy-hour secrets, that just published in today’s edition of USA Weekend. Learn to avoid the pitfalls at your local “cinco” bar or restaurant and found some surprising tips on how to still enjoy Mexican munchies with your favorite beverage. I am excited to share my message of healthy yet tasty options with USA Weekend’s 48 million readers. So celebrate this Cinco de Mayo the healthy way — with none of the worry and 100% of the fun!